Ipé is a beautiful and very durable hardwood. If you want your outdoor project to stand up and stand out for a long time use Ipé. Containing no harmful chemicals, Ipé can be used near water without potential contamination. 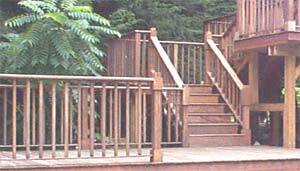 This is a 1x6 multi-level deck (Ipe is so strong that you only need 1x6 for equivalent strength of 5/4x6) with 4x4 posts, 2x2 balusters and moulded rail. Once installed Ipé can be left to weather naturally without added hassles. If the new appearance is desired Ipé can be power washed back to its original finish. Hardness: Janka hardness of 3680 as compared to the hardness of 1290 for Red Oak.